Comfort Inn Kings Cross London Hotel is ideally located in the heart of London just a few miles away from the Heathrow International Airport and within minutes from King's Cross Station and the local bus system. This central London location does not in any way hamper the hotel's tranquil ambience, appreciated by all the guests staying in London. The Comfort Inn Kings Cross is nestled amidst the best of London's attractions and major corporate companies, making it the ideal hotel in the city for both business and pleasure travellers alike. Comfortable accommodations welcome the weary travellers, offering them all conveniences for a relaxing stay. Comfort Inn Kings Cross Hotel's guest rooms are thoughtfully appointed with contemporary amenities such as cable / satellite TV, multiple phone lines, in-room safe, iron and ironing board. Wireless Internet connection is available in all hotel rooms. 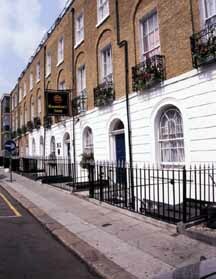 Photocopying and faxing facilities are also provided at this London hotel for the benefit of business travellers. The well rested traveller is woken up to a delicious breakfast each morning, complimentary of the Comfort Inn Kings Cross London Hotel. Free newspaper is also provided for the hotel guests during the weekdays. For those who do not have access to a laptop and would like to surf the Internet or check their e-mail, this Comfort Inn hotel provides a computer with Internet access at the hotel lobby. London is home to scores of historical landmarks, exclusive shopping and famous theatres that attract a large number of tourists each year to this wonderful city and Comfort Inn Kings Cross is locate within close proximity to most of them. Madame Tussauds, Buckingham Palace, Royal Albert Hall, Piccadilly Circus, Trafalgar Square West End Theatres and Harrods are just a few of the attractions located closest to the hotel. Comfortable guest rooms featuring modern amenities are provided for the guests at the Comfort Inn Kings Cross London Hotel.